The Kansas Supreme Court heard oral arguments Thursday in an appeal to remove a temporary injunction regarding a ban on a second-trimester abortion procedure. The law, called the Kansas Unborn Child Protection from Dismemberment Ban, passed the state Legislature in 2015, but a district court granted the temporary injunction. At issue is the Kansas Constitution and whether its language implies a right to an abortion as a mirror of the federal 14th Amendment. Arguments Thursday touched on women's rights, fetal rights and the fact that the court had previously upheld murder convictions in the cases of slaying an "unborn child." State Solicitor General Stephen McAllister warned the court that agreeing that the state constitution covers a right to abortion would invite problems similar to those seen under Roe v. Wade. "What Roe versus Wade has brought to the federal courts is 44 years of contentious litigation," McAllister said. In response to the day's arguments, Trust Women, which operates the South Wind Women's Center in Wichita, said "a lot is at stake in this case." "We are hopeful that the Supreme Court will uphold the decision of the lower courts and rule in our favor," Trust Women founder and CEO Julie Burkhart said in a release. The court said it would take Thursday's points under advisement. Kansas' highest court appeared receptive Thursday to declaring for the first time that the state constitution recognizes abortion rights, with a majority of the justices skeptical of the state's argument against the idea as it defended a ban on a common second-trimester procedure. Abortion opponents fear that such a decision by state courts could block new laws or invalidate existing ones even if President Donald Trump's appointments result in a more conservative U.S. Supreme Court. Janet Crepps, an attorney for the New York-based Center for Reproductive Rights, which is representing the doctors, argued that it's important for Kansas residents to know what rights their constitution protects. "The federal constitutional protection seems to ebb and flow with the political tide," Crepps said. Abortion-rights supporters contend broad language in the state constitution's Bill of Rights protects a woman's right to obtain an abortion. The Bill of Rights says residents have "natural rights" including "life, liberty and the pursuit of happiness" and that "free governments" were created for their "equal protection and benefit." The state argues there's no evidence that when the constitution was written in 1859, its drafters contemplated the issue in a legal environment in which abortion generally was illegal. But four of the court's seven justices peppered state Solicitor General Stephen McAllister with questions about the state constitution affording no protections for abortion rights now. Justice Dan Biles asked McAllister whether the state would face any limits on its power to restrict abortion, so that it could force a woman to carry a pregnancy to term even if she faced dying. As McAllister struggled to answer, Justice Carole Beier said, "The uncomfortable answer you're trying not to give is, 'No.'" Yet the justices appeared to struggle with what standard the state courts would use in reviewing abortion restrictions. McAllister noted that after the U.S. Supreme Court issued its landmark Roe v. Wade decision in 1973, more than four decades of contentious court battles over abortion followed. And Justice Caleb Stegall, the only appointee of conservative Republican Gov. Sam Brownback, worried about Crepps' argument that constitutional rights evolve to reflect a changing society and "the general march of progress." "How is this anything other than just a blank check to judges?" Stegall said. Abortion opponents worried enough about the lawsuit's outcome that they waged an unsuccessful, pre-emptive campaign to oust four justices from Kansas' highest court in last year's election, including Beier and Biles. Six justices were appointed by Democratic or moderate Republican governors. The justices have faced strong criticism in the past from the Republican-controlled Legislature and Brownback over past rulings in a wide variety of cases. The Kansas law at issue bars physicians from using forceps or similar instruments on a live fetus to remove it from the womb in pieces, using the non-medical term "dismemberment abortion" to describe the procedure. Such instruments are commonly used in dilation and evacuation procedure, which the Center for Reproductive Rights has described as the safest and most common abortion procedure in the U.S. in the second trimester. The Kansas law was model legislation drafted by the National Right to Life Committee. The group says similar bans have been enacted in six other states Oklahoma, West Virginia, Mississippi, Alabama, Louisiana and Arkansas. Abortion providers reported performing 629 dilation and evacuation procedures in Kansas in 2015, according to the latest state health department data available. That was 9 percent of the state's total abortions. The lawsuit against the Kansas law was filed by Drs. Herbert Hodes and Traci Nauser, who operate a women's health center in the Kansas City suburb of Overland Park. A Shawnee County district judge's ruling put the law on hold beforehand; the Kansas Court of Appeals split 7-7, allowing the judge's decision to stand. 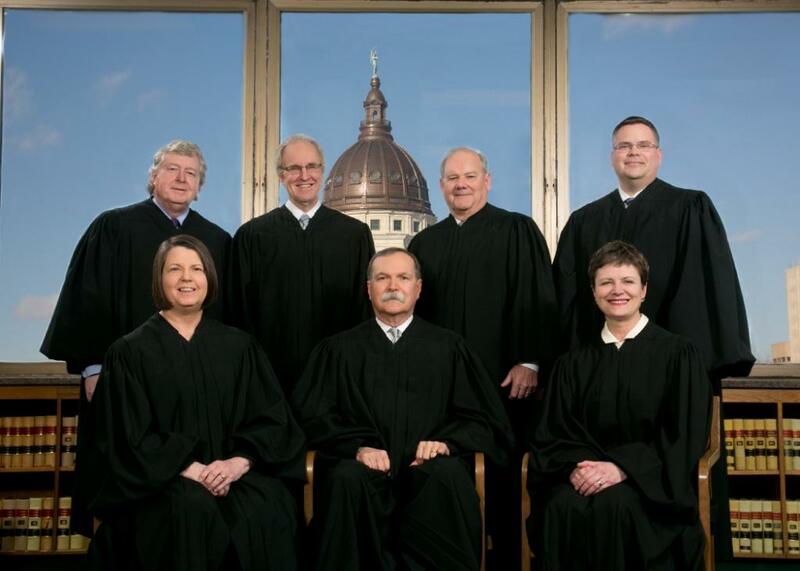 The Kansas Supreme Court will hear oral arguments Thursday morning on whether the state constitution protects a woman’s right to an abortion. Last year the Kansas Court of Appeals said it does. The high court’s decision was expected after the Kansas Court of Appeals upheld a trial judge’s decision to block Kansas’ so-called "dismemberment ban." The 2015 ban was challenged by two Overland Park doctors who operate one of three abortion clinics in the state. An attempt to ban a certain 2nd-trimester abortion procedure has been stopped by a Kansas Appeals Court. The ruling came on the anniversary of the U.S. Supreme Court Decision of Roe V. Wade, allowing abortion in the country. The ban, which is referred to as the dismemberment ban, was introduced into the legislature and passed last year.